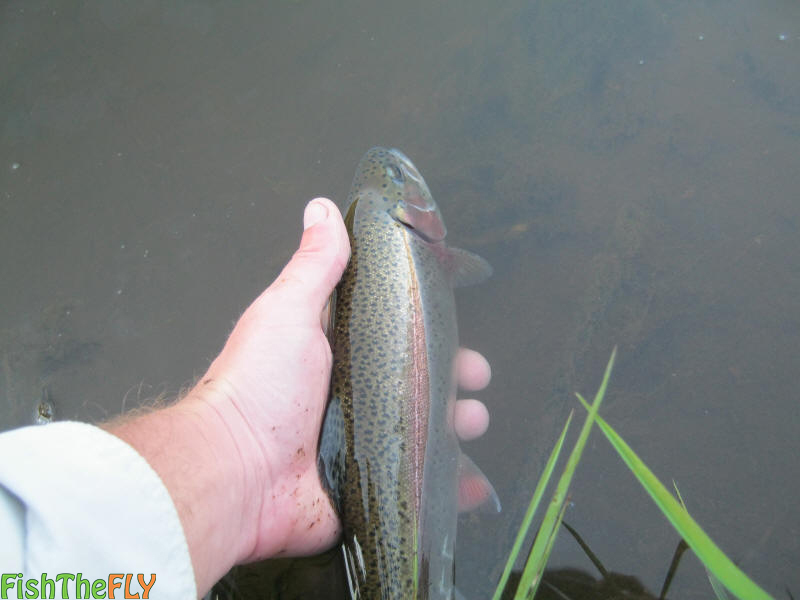 How To Catch Rainbow Trout On fly? Rainbow Trout on fly are one of my favourite freshwater fish species to target. The beauty, the history and the habits of this fish fascinate me. The Rainbow Trout (Oncorhynchus mykiss) is one of the most sought after and targeted fish on fly in South Africa… The Smallmouth Yellowfish is probably the only species that fly fishermen target more than the Rainbow Trout. It gets it’s name from the beautiful colours this fish possesses no doubt, and can attain weights of over 8 kilograms in stocked dams in South Africa. Wild fish, or fish that were introduced originally into the streams of the Western Cape, Eastern Cape and Mpumalanga, can grow to over 5 kilograms and live for about 5 years or so. Fish that are stocked do not have a life expectancy of more than 4 years in general. Rainbow Trout were introduced from North America in 1897, and you can read more about their history and the history of the Brown trout here: History of Trout in South Africa. This species of fish is also used for aquaculture purposes and is well known for having a variety of waters dedicated to fly fishing only. 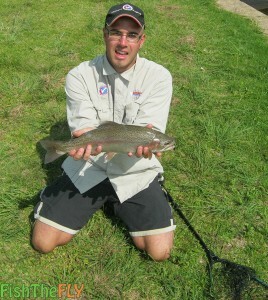 It is often frowned upon to catch Rainbow Trout on conventional tackle. We have also developed a table where you can get estimates of what your Trout weighs by measuring it. Rainbow Trout spawn and breed betwenn June and August each year, and they require flowing water in which to spawn. 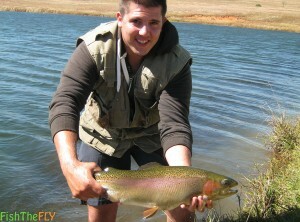 This is the difference between stocked Rainbow Trout and wild Rainbow Trout in South Africa. Dam Rainbows, often called “stockies” cannot spawn properly unless they have a river or stream in which to move up stream and spawn on gravel beds. 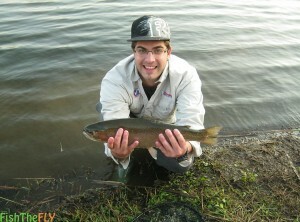 Read about how to catch spawning Trout in stillwaters here. Rainbow Trout generally need crystal clear and well aerated waters in which to survive. They can survive in warmer waters, but they ideally need the water temperature to be 21 degrees celsius or lower. Another reason why many Rainbow Trout to do not spawn properly in most of South Africa is that the flowing water they need has to be 15 degrees celsius or lower. Once the Rainbow Trout has bred successfully the females eggs will hatch between a month and two months later. They are free swimming as soon as they are born. Males generally need to be one year or older to spawn, while females need to two years of age. Learn how to handle Trout here. The Rainbow Trout is an opportunistic feeder, and although it mainly feeds on insects, larvae, mayflies, midges, caddises and aerial insects, they will also take small fish, frogs and platannas, crabs and other swimming organisms. Fly fishing for the Rainbow Trout dates back hundreds, and possibly thousands of years, and over this time there have been a variety of techniques used to catch both the Rainbow Trout & Brown Trout, the methods we find most successful can be seen below. Rainbow trout rise throughout the day on streams, rivers and dams, and they are feeding on newly hatched insects, and aerial insects. This is by far the most fun, and frustrating way of catching Rainbow Trout on fly. You need to match watch they are feeding on as close as you can. You will often see the Rainbow come up to your fly, and you get ready to strike, only to see them turn away. Best thing to do in this situation is to put on a small dry fly that mimics whatever insects are around at the time. This is best done with a 4 or 5 weight fly rod (2-3 weight on streams), with floating line and a tippet of 2-6lbs. Wet fly fishing is when you use streamers and wet flies. You pull them through the water and wait for the Rainbow Trout to latch on. The best techniques we have used are very fast retrieves along the bottom, figure of 8 retrieves close to the bottom, and short but jerky and erratic retrieves. This is ideally done with sinking line, and it is best to fish as close to the bottom of the water as possible. A 5 to 6 weight fly setup is perfect for this application, with a 4 – 10lb tippet. Nymphing is best done on streams or on windy days on stillwaters. You can use a single nymph or two nymphs (One nymph tied to the hook of the top nymph). Smaller nymphs generally work better, as once again you are imitating on what the Trout are feeding on. You need some form of drift to get them on nymphs effectively. A 5 weight rod (3-4 weight on streams), is perfect for this application. Floating line and 4 – 6lb tippet is the way to go. Emergers are insects that are just about to hatch and occur close to the top half of the water column. 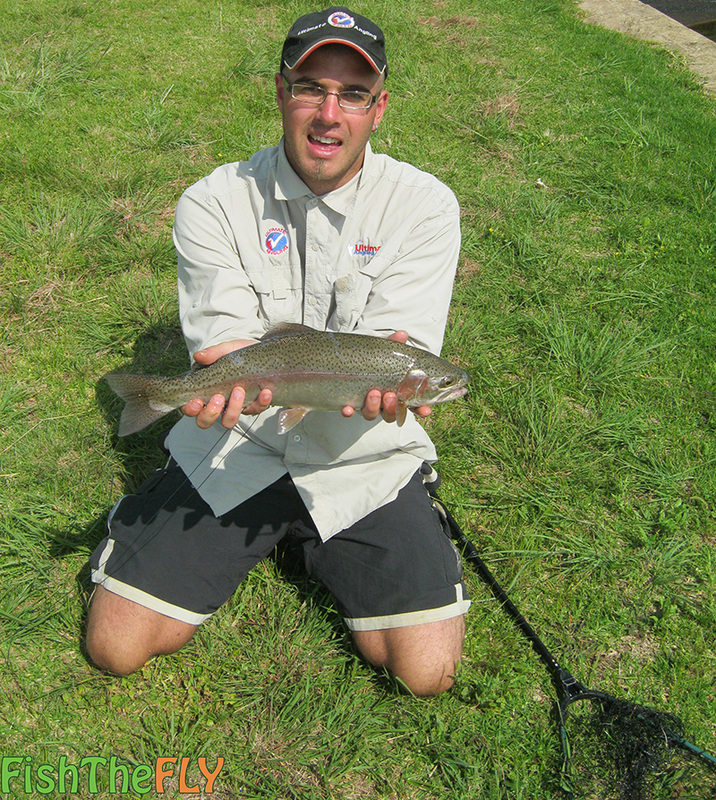 You can identify if a Rainbow Trout is taking an emerger because they do not fully rise. Rather there is a ripple, or a tail or dorsal fin will come up out of the water. Buzzers are great and should be fished on a floating line with 4 – 6lb tippet. A 4 to 5 weight rod (2-3 weight on streams) is perfect for this form of fly fishing. The follow my leader technique is great for big stillwaters and float tubing. What you do is have a big bulky wet fly with intermediate or sinking line, and following behind it is a small nymph (The bloodworm works really well here). 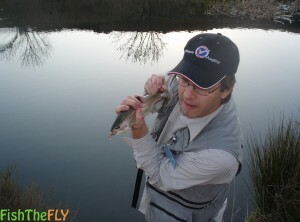 You tie the smaller fly behind the bulky fly on the bottom of the hook of the wet fly or streamer. This is a good way to get fish when they seem to have lockjaw. 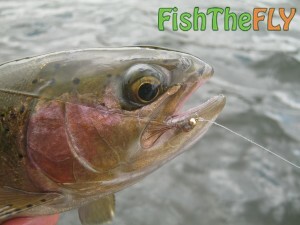 The Rainbow Trout generally get attracted to the bulky fly, and will often take the trailing nymph out of aggression. A 5 to 6 weight setup with sinking or intermediate line is good here, and tippet of between 6 – 10lbs should be used.